El Cazador, a Spanish pirate, has just stolen The King’s Cross, but his ship is surrounded by cannon fire. Desperate to escape, he slips over the side of his ship, deserting the rest of his crew. As he makes his way to shore, he knows that the Mexican revolutionaries will soon be after him. The captain decides to bury the heavy chest. Almost two hundred years later on September 15, 2013, the town of Knightsbridge, California is going wild with the news that skeletal remains of a notorious pirate have been found by hikers in a cavern. His leather journal lay nearby containing the details that he was returning to find a hidden treasure. Professional organizations and local treasure hunters are already hard at work seeking to discover the chest. Will and his father have recently moved to Knightsbridge; Will has few friends. He is intelligent and clever and immediately becomes interested in treasure-hunting. When Mikey discovers Will’s research notes, he cannot wait to share them with his two best friends, Evelyn and Susan. Fate and mutual curiosity will throw all of them together into a partnership. The foursome will face challenges from international organizations, fellow students and entrepreneurs, but they will pool their intelligence, computer skills, and mechanical abilities to sort through all possibilities until they finally solve the mystery. 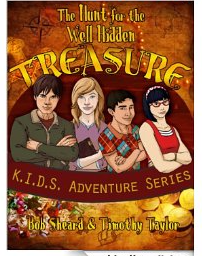 Will they find the treasure and become rich? Needless to say, the adventure leaves them determined to set up a detective agency to solve future mysteries and reward readers with lots of adventures. This book has a plot with enough twists and turns to keep you guessing, the dialogue is authentic to middle grade students, and the characters appealing and well-developed. Targeted for ages eight through twelve, but written well enough for older teens as well. Detective story fans might just have a new series to follow. If you enjoyed this post, please subscribe by clicking on the word Follow or by hitting the orange RSS Feed button in the upper right hand corner. I was drawn to this book by the second part of the title. Because I write picture books for kids (and adults), I was curious to see how the author would connect the concept with the writing of biblical stories. Strangely enough, she begins by stating the reasons for NOT writing Biblical stories. These include the wish to get rich, demonstrate superior intelligence or the presumption that you and your religion can teach better than anyone else. The correct reason for writing them is that the Bible is full of timeless stories that can be meaningful to any generation. Proceeding from there, the author lays out how to write such a story, how and where to search for one, the journalistic method , the technique of story flow, presenting the protagonist, writing the dialogue, and presenting your point of view. Once your story is written, the really hard work begins. The author must edit over and over again, gather the artwork, design the cover, correctly format the work and then publish the story. Authors must know how to interpret the inconsistencies in the Bible and reconcile them with their own view of Christianity. MacLeod gives the writer some excellent pointers on how to avoid mistakes that can derail a book if the appropriate illustrations are not carefully chosen to correlate with the meaning of the text. I thoroughly enjoyed the author’s presentation and common sense advice. 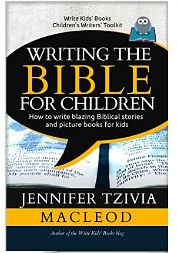 Even though I have never written a Biblical story, I appreciate the relevance of the topic to that of writing picture books for children. This book is a must for writers as well as parents, librarians or teachers who are the vehicles for providing access to the literature that their children read. First in a series of middle grade chapter books featuring a family which includes four cats and a dog along with their human family. In this book, Kimba, a heterochromatic cat, is recruited by an agency of sci-fi cats to restore cats to their rightful place as rulers of the universe. Kimba is distinct not only due to the fact that she has one green and one blue eye, but also because she combines the curiosity of a cat with the sensitivity of a human. Kimba and her sister Hiro’s lives change one day when Kimba sees a mysterious image in the bathroom mirror. Turns out a race of cats led by its leader Regalus are plotting a world-wide takeover and Kimba has been selected to be one of their spies. But Kimba has never even been outside the house, and Hiro has even less interest in changing her comfortable existence. How can they possibly succeed? The story line starts out slowly, then builds up as Kimba eventually must choose between her family and her cat lineage. 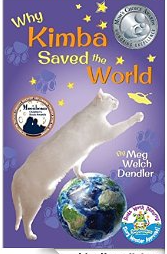 Dendler knows the character and personality of felines well; she does a superb job of getting into Kimba’s head and allowing the reader to identify with her. Middle grade readers who love animals will like this book; it paints a realistic picture with enough sci-fi details to make the story convincing. In the end, Kimba, like many of her young readers in their everyday lives, is forced to make a difficult decision. Where does her loyalty lie? 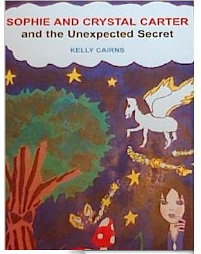 Recommended as an independent read for students age nine through twelve or as a read aloud by a librarian or classroom teacher. Available in kindle and paperback. The second and third books in the series have recently been released. Looking at this title and cover, you probably would guess that this story is a magical adventure. The author has seamlessly interwoven a diversity of elements into an intriguing plot with so many twists and turns that the reader is left guessing right up to the end of the story. At first glance, ten year old fraternal twins Sophie and Crystal Carter are just like most girls their age. They live with their mom, Sarah in a small town. Sophie is shy and nervous, while her sister is rather confident and bossy. This summer, the girls are surprised to hear that they would be staying with their maternal grandfather, whom they had never met. Their mother needs to take care of some business; she appears irritable and upset. Upon arrival at the house, the girls discover it is creepy and old. Soon the girls hear strange noises, and upon investigating the twins find some disturbing things in the basement. When the girls confront their grandfather, they are astonished to discover that everyone in the family is not who they appear to be—even themselves. Granddad decides to come clean and tell them the truth. I don’t want to give away the intricate and well-written plot filled with surprises. Readers will find spiders, witches, leprechauns, bats, pixies, winged horses, magic mushrooms, spells, and potions with plenty of evil forces at work. This newly thrown together family will need to fight for their survival. In doing so, they will learn a lot a about themselves in the process. Cairns does an excellent job with character development; I really felt as if I were in all the character’s shoes. Things never get dull. The reader will be left guessing as to the outcome right up to the end of the adventure. Be forewarned, the ending is a bit of a tearjerker. This book is targeted for ages seven and up. Despite the lack of illustrations, the story of less than 100 pages is so well written that it should hold the interest of younger readers once they get past the first few pages. As an adult reader, I could not stop reading until I got to the end. Looking forward to more adventures with the Carter family. If you enjoyed reading this post, please subscribe by clicking on the word Follow or by hitting the orange RSS FEED button in the upper right hand corner of this post. I look forward to sharing more great stories with you. 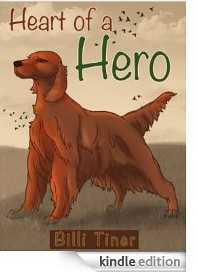 This book is a portrait of a loyal and brave Irish Setter, inspired by the author’s childhood family dog. As a pup, Lady wanted nothing more than to emulate her mother, who was a prize hunting dog. Carl, a teenage farmhand, develops an affinity for her, and Lady is elated when her owner Mr. Thompson sends her to live with Carl. At first life is wonderful, then World War II breaks out; and Carl leaves for battle. Carl never returns. A friend suggests to Carl’s dad that the Marines are looking for war dogs, and Lady is offered up as a candidate. After rigorous training and many adventures with new dog friends Scout and Fancy, Lady is sent to the Pacific with her human handlers, Tim and Steve. Lady succeeds in becoming a war messenger dog. She will prove herself a worthy hero. After the war things return to normal for a while, but Lady has battle scars and her new owner will make a decision that does not include her. More uncertainty for Lady and a dramatic change in life circumstances again. Will Lady find peace, dignity and happiness in her final years? This book makes a great read for middle grade students. It deals with complex issues in a plot that is simply laid out and easy to follow. Loyalty, bravery, courage, coming of age, bullying, and family relationships are explored. The characters are well developed; the reader can identify with Lady as she narrates the story from her point of view. I do think the plot moves a bit slowly in sections, but that may be due to the fact that the reader is eager to see what happens next. Recommended for dog lovers, history lovers and anyone who enjoys a good family read. Available in kindle and paperback editions. Patrick loved his mother, but one thing about being a leprechaun made him unhappy. His mother insisted that he always wear green, the color of Ireland. That made Patrick sad because he loved all colors in the world around him, especially yellow. But all leprechauns in his school wore green, and that was just the way it had to be. One day at recess, Patrick observed a beautiful rainbow; he decided to go off into the forest to try to find that beautiful yellow pot of gold that was rumored to be at its end. Soon his teacher and the whole community of leprechauns began to worry. Will Patrick find his pot of gold? Is he going to be in trouble with the adults? The story has a surprise ending that will affect Patrick, the leprechauns, and his family. 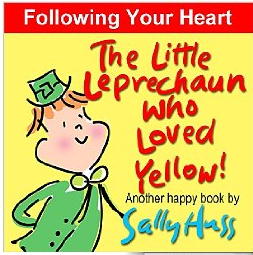 Delightful bedtime story that teaches children rules do not have to be arbitrary and that children and parents can learn to follow their heart. Perfect way to celebrate St. Patrick’s Day with the family, preschoolers and primary grade children. A WOMAN AHEAD OF HER TIME…. I picked up this book not really knowing what to expect. Of course I had heard of Annie Oakley, but I did not expect to find there was so much more than a wild, undisciplined sharpshooter. Sure got a surprise when I started reading this account which is not a biography but rather a colorful portrait of the highlights in Annie’s illustrious career and her fifty year marriage with Frank Butler. Annie was born in 1860 to a poor Quaker farm family living in Ohio who named her Phoebe Ann Moses. One of seven children, at the age of six her life soon became even more difficult when her father died. By the age of eight, Annie had learned to shoot small game which she sold to help support her family. Before Annie hit her teens she was competing with men in shooting competitions. During one of these she met sharpshooter Frank Butler; Annie won the competition by one point. Fifteen year old Annie promptly fell in love and married the man with whom she would soon perform in the vaudeville circuit. A few years later the couple would join Buffalo Bill’s Wild West Show with Bill Cody. They traveled throughout the country and later on to Europe. Annie wanted her name to match her frontier image; the name Oakley actually was taken from a town near her farm. When it became clear that Annie was the star feature, Frank graciously decided from that point on he would be her manager instead of her shooting partner. Marshall does a good job of describing their whirlwind life on the tour circuit, They witness the construction of the Statue of Liberty on Bedloe Island, attend the fiftieth anniversary celebration of Queen Victoria, meet General Sherman, P.T. Barnum, and Kaiser Wilhelm. The couple sail the canals in Venice and walk the streets of Paris. Annie appears in stage plays and gets invited to participate in one of Thomas Edison’s first moving picture ventures. After an unfortunate train wreck in 1901and a bad automobile accident in 1907, Annie and Frank open up sharpshooting training centers to teach their skills to others. Though they never had children, Annie and Frank gave generously to orphanages and children’s hospitals. Ironically, Annie died of pernicious anemia, which may have been cause by her constant exposure to the lead of the bullets that she used to shoot. Frank lived less than three weeks after her passing. The author weaves an exciting story depicting Annie’s strong pioneer spirit of determination and stubbornness, a love story, history, adventure, and travel. Annie presents a strong female character well ahead of her time willing to take on the challenges of one whose life spanned the era from the Civil War through the end of World War I. This book can be enjoyed by readers ten and older. Teachers can certainly use it as a tool as a window to life during that era as well as a woman ahead of her time.